AFC - 08/13/05 Tourists are Vegetarians, too! Although Croatia is proud of its sea, a popular tourist-destination during the summer, one of the biggest problems in the Croatian tourist offers is the ignoring of the vegetarians' needs. Namely, there are people who do not eat animals, whilst many of them do not eat any food of animal origin, but do visit our hotels and restaurants, as well as public institutions like hospitals, during their vacation. 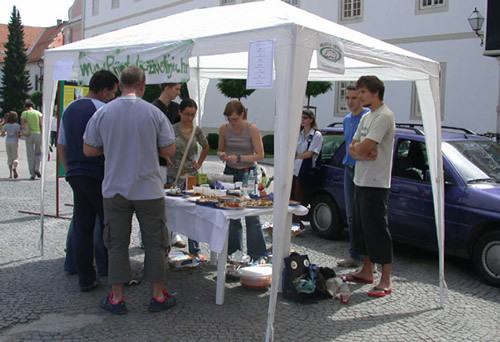 For instance, only in Germany there are more vegetarians than is the population of Croatia! With traditional offer of roasted animals without any offer for the vegetarians we are sending a clear message that Croatia is "lagging behind" the rest of the world, because in other parts of the world such diet is a customary part of a tourist offer. 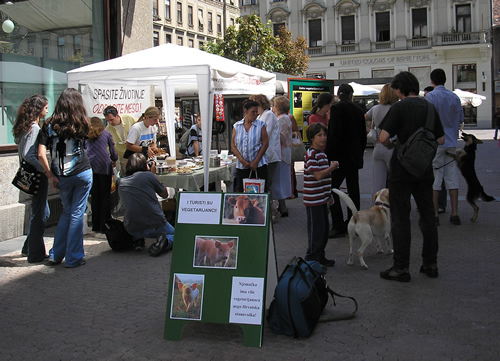 For this reason, Animal Friends will on Saturday, August 13, 2005, in Varsavska ulica at 12 noon hold a presentation and a tasting of the vegan menu, thus giving opportunity to the passers-by to enjoy delicious and healthy specialties like smoked tofu and seitan, salami with olives, cream button mushrooms soup with soy cream, soy dumplings in béchamel sauce with rice, marinated seitan scallop with veggies, veggie salad with frankfurter and fresh soy cheese, pancakes with chocolate, walnuts and cream, and milk shake with yoghurt. 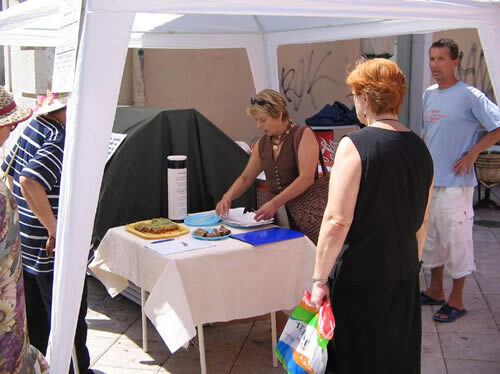 The action, which will include info stalls, presentations and tastings, simultaneously will also happen in Varazdin, Krizevci, Umag, Rijeka, Zadar, and Split. 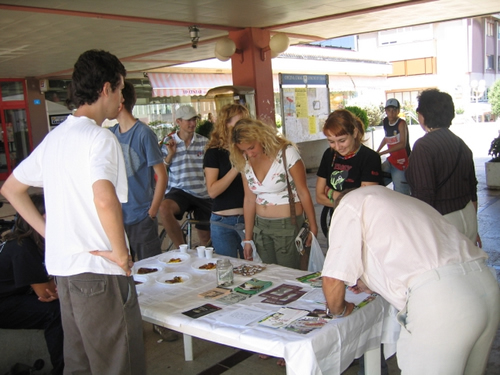 On the info stalls also recipes of the offered dishes will be available, together with the costs needed to prepare each dish, in order to show that a vegan menu shouldn't be any different from the other menus in restaurants. 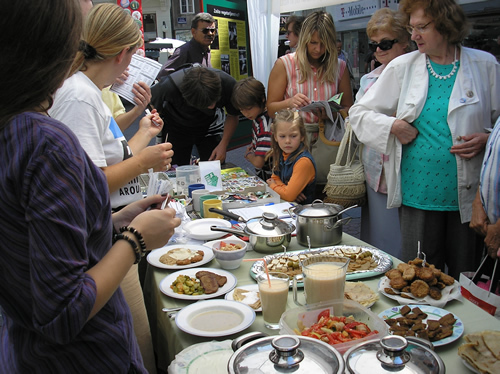 Our activists will be directly answering to the fellow townsmen to all their questions about vegetarianism, whilst everyone interested will be able to sign a petition for the introduction of vegetarian meals to public institutions. 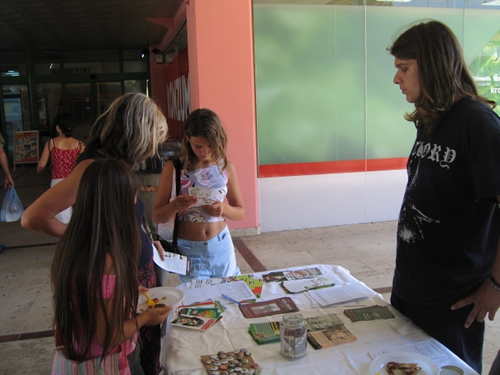 Ever more Europeans accept vegetarians because of animals, environment and their own health. 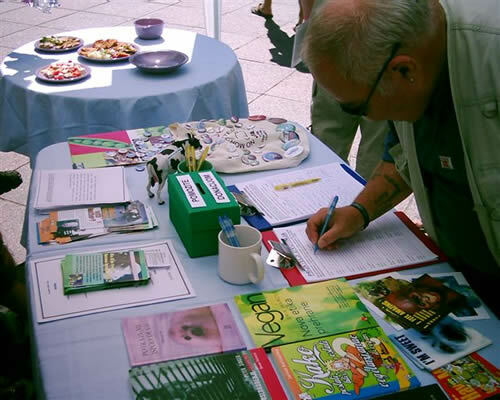 Vegetarianism, that is, veganism, is a growing movement based on a diet that excludes absolutely unnecessary violence to animals, which raises responsibility toward environment and health and also saves precious resources, thus being more economical and profitable. 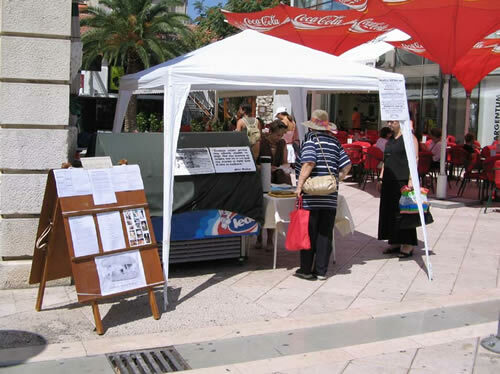 Tourists who are coming to Croatia are shocked by the sight of spit-roasted lambs by the roads, whilst on the seaside the gastronomic offer is reduced to fish and other sea animals and meat products. 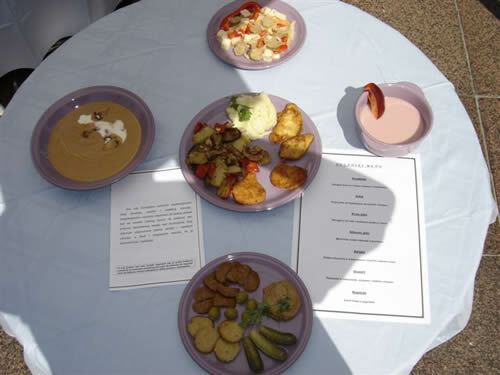 Rare are the hotels and restaurants which include vegetarian dishes in their menus. 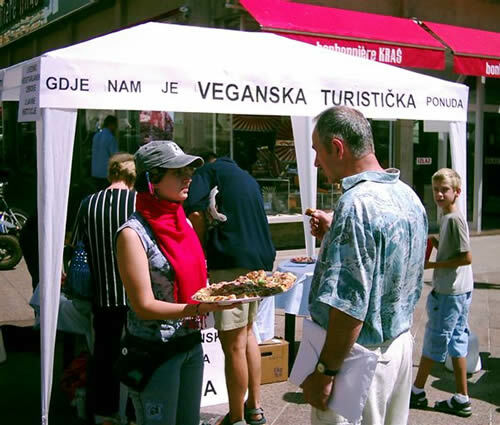 The problem in Croatia is not only lack of dishes in tourist offer, but also impossibility for vegetarians to eat in hospitals, schools, army, prisons and other institutions open to all citizens of Croatia. With this action we want to encourage caterers, tourist workers and public institutions to include veg(etari)an meals in their menus, which would by all means also benefit tourist promotion of our country, taking into consideration the ever growing number of vegetarians worldwide. 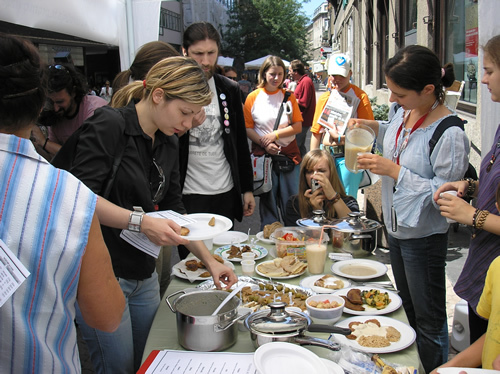 We also offer our cooperation to the personnel of public institutions in regard to organize the preparation of meals, contacting producers and distributors of high-quality vegetarian food, as well as courses for cooking and preparation of vegetarian dishes. 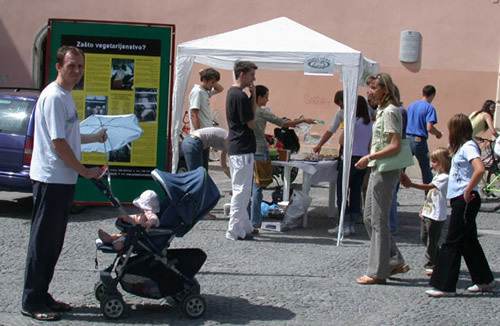 More information about vegetarianism, as well as the list of restaurants and stores with vegetarian food, can be seen at our web pages www.prijatelji-zivotinja.hr and www.vegekit.com.